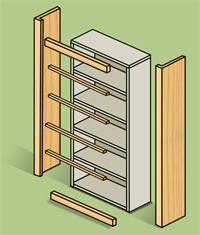 Unlike traditional wood cabinetry or millwork, Wood-Tek shelving is steel at the core, keeping it rigid and level. The wood trim provides an elegant look while the steel shelving allows superior functionality. 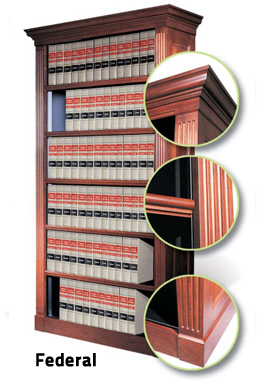 As with other steel shelving products, Wood-Tek is highly adjustable - unlike millwork shelving that is often constructed in one fixed position. Each 36" x 12" span of Wood-Tek shelving can support over 300 pounds - and you will never have to worry about it sagging or breaking! Just imagine how much can be stored in a Wood-Tek mobile storage system! 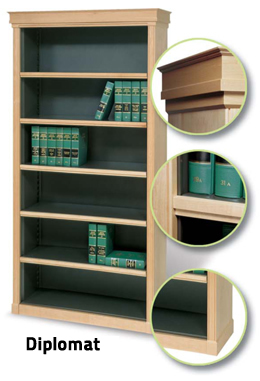 Two models of Wood-Tek shelving are available - the Diplomat and the Federal. Within these models, there are many elements of customization available - take a look below to see how you can create the perfect match for your office decor!